Sick of hearing about the Xbox 360's red ring problem? Microsoft hopes so. With mea culpas flung about and dollars set aside, the company has hunkered down, knowing full well that industry press will (has, actually) tire of the story. For a couple really rough weeks, the coverage was brutal, but the furor predictably died. Throughout the firestorm, Microsoft made a point to promise a painless, smooth warranty/repair experience for anyone whose console heads for the red. Despite word from Redmond, though, the 360 recycling process is anything but painless. According to customers going through it now, it's getting worse every day. Not only does Microsoft still send refurbished consoles as warranty replacements - consoles that may have already failed once and, often, fail again - but aside from apologizing profusely over the telephone, the company flatly refuses to take any action to reduce the inconvenience or delay for the end user. Turnaround time is increasing, too, and worse, many customers hook up their returned consoles only to see the same sullen red glare. Kotaku editor Brian Ashcraft's 360 returned from triage and failed within five minutes. "I turned it on, fired up Gears of War and it died again." Subsequent to his post on the subject at the gaming news site, Ashcraft heard from Microsoft PR, "who asked me if I had a working console and said it was attempting to get Elites to all journalists." Shortly thereafter a new 360 Elite materialized on his doorstep. While it's hardly shocking that Microsoft is eager to appease a Kotaku editor - the influential site receives over 20 million visits a month - regular customers don't enjoy the same treatment. 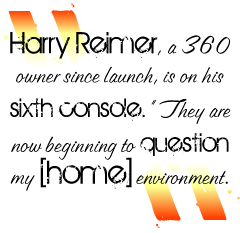 Harry Reimer, a 360 owner since launch, is on his sixth console. "They are now beginning to question my [home] environment. ... They had no response when I informed them that my PS3 is on the same circuit without issue." Though Microsoft dismisses customers with multiple failures as merely a "vocal minority," the stories are common. And even if they represent only a fraction of users, that response ignores a crucial fact: One failure is too many. Two is unbelievable; by the third, Bill Gates himself should hand-deliver a replacement. The company should hire the Dead or Alive girls to play strip Halo with you for a weekend. And yet stories of as many as a dozen returns do surface, turning an annoyance into a disaster with repercussions that may outlast the life of the console. Returns have spiked since Microsoft's July warranty extension announcement, and the once super-efficient service center is groaning under the strain, which translates into ever-longer wait times. "It took about six weeks to get a new 360 back," says Eduardo Gabrieloff, "and when it arrived it was broken. It took another six weeks to get another machine, and I spent hours on the phone with support. ... Finally I wrote an email to Steve Ballmer. ... The next day I got a call from an escalation representative." Getting "escalated" in 360 support means you get a special code and a direct-dial number to a service rep who is supposed to personally shepherd you through the process, and possibly offer recompense for your troubles, though whether or not you get it appears exactly proportional to how much you complain. Emailing the Microsoft CEO is the ultimate escalation, and Gabrieloff isn't the only gamer to have done so. Others are stuck waiting. "They told me to expect six to eight weeks," says Phil Callihan, a customer on his first 360 repair. "Christmas is coming. I've already bought games for my kids. They're going to be under the tree with no system to play them on. I asked the rep for a loaner, but she wouldn't provide a replacement until mine is in their possession. What am I going to do? Sneak off to the South Seas with their broken Xbox? They have my credit card number, my name, my Live ID. The lady apologized about 40 times. It didn't make me feel better."